Rob Bland (Intern- MLB Reports): With the deadline only a day away, I expect a flurry of moves in the next 24 hours, and the Boston Red Sox are sure to get involved. With injuries to Clay Buchholz and Daisuke Matsuzaka, combined with the inability of John Lackey to get outs, the BoSox have been in on every rumored starting pitcher being moved. Here’s a look at Boston’s targets, and who they would have to give up in order to consummate a deal. The Japanese import could bring a good haul for the LA Dodgers, and it is believed that they are looking for a young catcher or a starting pitcher in return. I don`t believe the Red Sox would give up Anthony Ranaudo for him, but it is the Red Sox, and their system is fairly stacked. 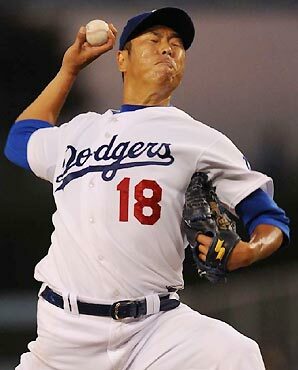 Kuroda isn`t a top line starter, but could fit in nicely behind Josh Beckett and Jon Lester right now. In his last 10 starts, Kuroda is 1-8 with a 2.66 ERA, giving up more than three runs in a start only once. He is on pace to break the 200 inning mark for the first time in his MLB career. I could see the Dodgers wanted a package that could involve Kyle Weiland, who has been at AAA, including a couple of underwhelming starts for the Red Sox. He has been dominant in AAA, and while his ceiling might not be very high, Weiland could be a piece used to obtain Kuroda. Former top pick Andrew Miller could be involved as well, as he has shown flashes of the potential that the Tigers saw to draft him 6th overall in the 2006 draft. Vargas is another pitcher who hasn’t had much luck this year, going 6-9 with a 4.09 ERA. He too is on pace to break the 200 inning plateau for the first time in his career. He gives up a lot of fly balls and home runs, so he might not be the best fit for Fenway Park. Harang has made the most of his move to spacious Petco Park. In the pitcher’s haven, his ERA is 2.92, as opposed to 4.31 on road games. Harang in Boston might not be a good fit due to his propensity to give up the long ball, but, whether it is due to the park or not, he has only given up 9 homeruns so far this year. Playing the last five years in Baltimore will never help your win-loss record, but Guthrie has been a reliable arm for the Orioles over that time. His career ERA of 4.16 while mostly pitching in the AL East proves that he could be a capable pitcher for the Red Sox. Although he is 5-14, he has pitched fairly well this year, and could be great addition to the back-end of the Red Sox rotation. Bedard’s once promising career has been derailed by injury after injury. He has always possessed tremendous stuff, but hasn’t been able to stay healthy. In his last ten starts, he has thrown 58 2/3 innings, striking out 64. Bedard has never amassed 200 innings, and his career high is 196, in 2006. All of these pitchers are available and the Red Sox are in talks with each of the respective teams. Many of the prospects mentioned in this article will be in play, as well as Bryce Brentz, a powerful outfielder in high-A. He needs to cut down on strikeouts but he is a solid right fielder for the future. The Cubs` outfielder could bring a spark of energy to the club. J.D. Drew is on the DL, again, so they do need an outfielder if they want to upgrade over Josh Reddick or Darnell McDonald. Johnson plays great defense and is hitting the ball pretty well this year, so he could slot into right field well at Fenway. 23-year-old catcher Ryan Lavarnway could be involved in a deal. He is a young catcher that isn`t too far away from the big leagues. Lavarnway has a lot of power as shown by his 27 home runs already this year. He is known as a good game caller and a smart catcher. Ubaldo Jimenez has tremendous upside and is signed to a team-friendly contract through 2014. The Colorado Rockies are asking for a prospect haul that most teams can’t even match. At this point, only the Detroit Tigers, New York Yankees and Toronto Blue Jays, together with the Red Sox are involved in talks with the Rockies. Although just 6-9 this year with a 4.20 ERA, he has made some great strides in the last couple of months. In his last 10 starts, he is 5-4 with 3.47 ERA and 64 strikeouts in 62 1/3 innings. Jimenez has lowered his ERA almost a full run during that time. Although some teams worry about his delivery, the big righty has been durable, throwing at least 198 innings in the last three years, and is on pace to break that mark again this year. 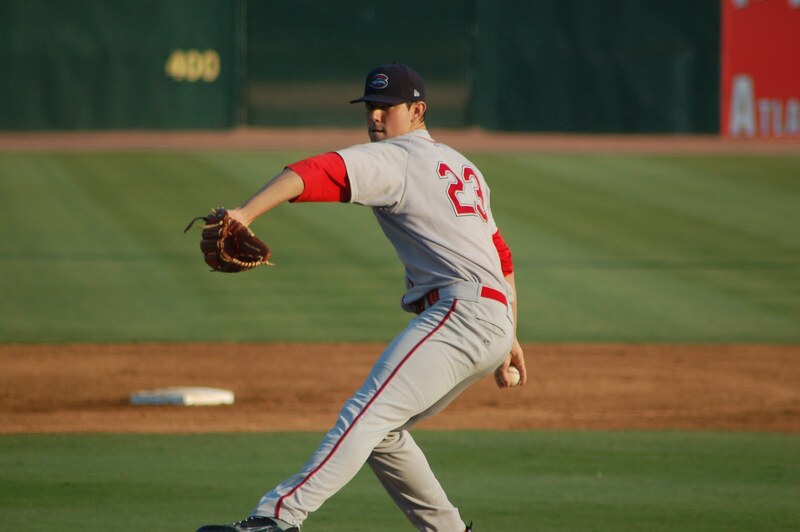 Anthony Ranaudo, a supplemental 1st round pick in 2010 started this season in A-ball, but could quickly shoot up the system in Colorado if moved. He possesses three above average pitcher and has front of the rotation stuff. He has good control and has great makeup and poise. Will Middlebrooks is a prototypical third basemen with a good glove. He hits for average, and for power, evidenced by his 17 home runs so far this season. He also has 7 stolen bases. He possesses a good baseball IQ and he should have a long career in the big leagues. Lars Anderson was once considered the top bat in the Red Sox system, and with Adrian Gonzalez in the mix, there doesn`t seem to be a spot for Anderson. He has good vision at the plate, sees a lot of pitches, and has gap power. As he continues to fill out, he will get stronger. I expect 20 home runs and 30 doubles a year out of Anderson when he finally does make it to the Show. I think that the Red Sox win the Ubaldo Jimenez sweepstakes, sending uber-prospects Ranaudo, Middlebrooks, Anderson and maybe one or two players to be named later. This gives the Red Sox a fearsome top three starters in Beckett, Lester and Jimenez. If Buchholz comes back healthy, they have an incredible rotation for years to come. Reed Johnson is also a great fit for the team, and I see them making a move for him. Rich Harden (A’s) for Lars Anderson and Player to be Named Later (Red Sox): Yet to be announced. This deal has not yet been finalized and may fall through. Likely Billy Beane is pushing strong for this one. Boston gets Harden, a talented but very injury prone pitcher that cannot be counted on. Oakland would get a top young hitting prospect in Anderson and a PTBNL. Oakland wins if this one does happen, stay tuned. Ubaldo Jimenez (Rockies) for Drew Pomeranz, Alex White, Joe Gardner and Matt McBride (Indians): What a difference a year makes. The Indians are going for it and have beefed up their rotation with the addition of Jimenez. 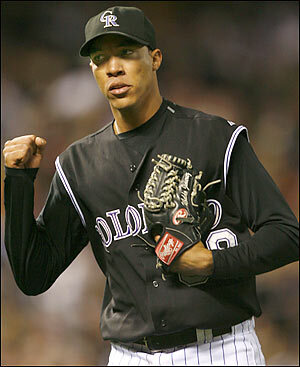 When on his game, Ubaldo is one of the best in baseball. Further, Ubaldo continues to be under team control, so the Indians don’t simply acquire a summer rental here. The keys to this deal for the Rockies are Pomeranz and White. Considered to be the Indians two best pitching prospects, the Rockies add to their farm while losing their ace. While Pomeranz is considered highly in baseball circles, I would have expected to see the Rockies get more major league ready talent. Considering that they were supposed to get Jesus Montero and Ivan Nova from the Yankees or Yonder Alonso, Yasmani Grandal and/or Homer Bailey from the Reds, I give the Indians the edge on this deal. Ace pitchers do not grow on trees and the Indians got one without giving up any of their major league talent or some of their other finer prospects, including Nick Weglarz. Competing with the big boys, the Indians get the prize of the trade deadline and likely a division title as well. Derek Lee (Orioles) for Aaron Baker (Pirates): The Pirates are going for it and while Lee is an aging first baseman, he is an upgrade offensively over incumbent Lyle Overbay. Baker is a Class A first baseman that is not considered a top prospect. This trade is a draw, as the Pirates beef up for their playoff run and the Orioles auction off an impending free agent to stock their system. Orlando Cabrera (Indians) for Thomas Neal (Giants): This deal came out of left field, as the Indians are still contending and were expected to hold onto Cabrera. With many young infielders on their roster, the Indians were prepared to sacrifice their utility man for one of the Giants higher rated prospect bats. Speaking to Neal on several occasions, he is one of the nicer young men you will ever want to meet in the game. Considered a great tools player, both offensively and defensively, the Indians have added another piece to their offensive puzzle while sacrificing a veteran that was expandable. The Giants, with injury and offensive woes, took a chance on Cabrera, a good luck charm for each of his respective teams in the postseason. While Neal was a big price to pay, the Giants are in win-now mode. A draw, as both teams will away happy from this exchange. Koji Uehara (Orioles) for Tommy Hunter and Chris Davis (Rangers): This is a good old-fashioned baseball trade. The Rangers pick up a veteran reliever, who is enjoying his finest campaign in the big leagues and could be a setup man or closer. The Orioles continue to stockpile prospects and add a starter and first baseman to their mix. Davis has one of the most explosive bats in the game when he gets hot and the Orioles could have their cleanup hitter for the next 5-7 years. Hunter should be a good #3 or #4 starter for the team. A draw as both teams achieve their respective goals in this deal. Jason Marquis (Nationals) for Zach Walters (Diamondbacks): I am a fan of what the Diamondbacks are doing in Arizona, but this trade doesn’t work for me. Marquis will pitch in Arizona, but I don’t see him being the effective starter the team needs to fight the Giants for a playoff berth. 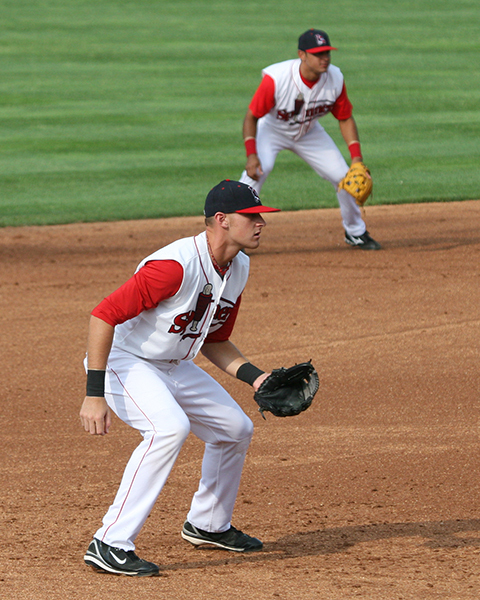 Walters is a prospect shortstop who could have been Stephen Drew‘s replacement one day when he left the team. Walters has a good offensive bat and was not worth the price of Marquis. Advantage Washington for adding another prospect to its growing farm while dumping a veteran pitcher that had no place on their roster. Mike Aviles (Royals) for Yamaico Navarro and Kendal Volz (Red Sox): The Red Sox get some sort of infield insurance, which was unnecessary in my estimation with both Marco Scutaro and Jed Lowrie on the roster. If Lowrie is out beyond early August as projected, then this deal makes sense. Otherwise, to give up two decent prospects for a player who has struggled this season and is unlikely to hit much in Boston does not equate for me. Advantage Royals for dumping a player who did not fit on the team and continuing to stock their system. Jerry Hairston Jr. (Nationals) for Erik Komatsu (Brewers): The Brewers get depth for their playoff run and the Nationals get a marginal prospect back. A draw. Doug Fister and David Pauley (Mariners) for Francisco Martinez, Casper Wells, Charlie Furbush and a PTBNL (Tigers): For a Tigers team that was considered early in the day to be in the hunt for Ubaldo Jimenez, this one is a bit of a let down. Fister will be a #4 or #5 starter for the Tigers, good but not great. Pauley was having an incredible season for the Mariners in their pen and should do well in Comerica. Wells will likely slot immediately into the Mariners outfield and the rest of the players are prospects to their stock their farm. While I’m not excited about what Detroit received, I am equally not impressed by what they gave up. Call this one a draw. Middle of the road players for players at this point. Denard Span (Twins) for Drew Storen and ? (Nationals): Yet to be announced. This one is a real head scratcher for me. I consider Span a good, but not great outfielder. This trade is not completed although many outlets are reporting that this deal will get done. The Nationals would give up their young closer if this deal happens and considerably weaken their bullpen. Span, while playing a strong centerfield is not the offensive bat the Nationals are looking for. After taking the Twins to the cleaners a year ago in trading Matt Capps for Wilson Ramos, this trade would be payback for the Twins. If Storen is part of this deal, advantage Twins. If the Nationals hang on to their closer, consider it a draw. Rafael Furcal and cash (Dodgers) for an unknown player (Cardinals): Yet to be announced. With Dee Gordon in the minors and money woes being an issue, this trade for the Dodgers is about getting younger and saving money in the process. The Cardinals are pushing for a playoff spot and if healthy, Furcal should give the team a spark offensively. Personally, I would not trust Furcal based on his injury history. It also remains to be seen which player the Cardinals get back. But overall, without all the specifics, if the Dodgers can unload Furcal and have the Cardinals pick up most of his contract, I will label this trade a Dodgers win. Ryan Ludwick (Padres) for an unknown player (Indians): Yet to be announced. The Indians are looking to make a strong playoff run and former Indian Luckwick would fit well in their offense this year. It remains to be seen what the Indians have to give up, but for a player in as strong demand as Ludwick, as long as it is not too much, give the edge to the Indians.